The Stofchecks and Ballingers have long been two respected funeral directing families in our local communities. In August 2007 they combined into one entity to better serve the communities of Richwood, Prospect and La Rue. Here is a brief account of their histories prior to the merger. The Ballinger Family has served area residents for more than 100 years. The business was founded by B.C. Ballinger in 1902 when he established a funeral home in West Mansfield. 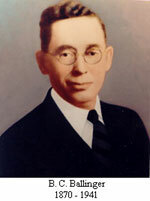 His son Cletus continued the operation, followed by the third generation funeral director, Bert C. Ballinger, who moved with his wife Phyllis and their family to Richwood when Ballingers purchased the former Sanders, later Hastings, Funeral Home in 1952. 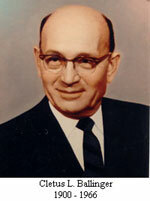 He operated the funeral home until his death in 1969. 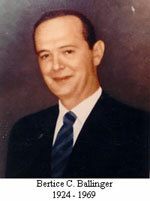 Richard Ballinger continued the family tradition at the Richwood facility and in 1972 expanded the business to Prospect when he purchased the Gehm Funeral Home. Rick fell victim to cancer at the age of 42, leaving behind a very young family. 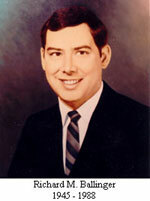 Rick's wife Janet continued the operation of the funeral home, eventually joined by their son Greg upon his graduation from the Cincinnati College of Mortuary Science in 1993. Greg married the former Gina Kavanagh in 1998 and they are the parents of 3 children: Avery, Derek and Sienna. 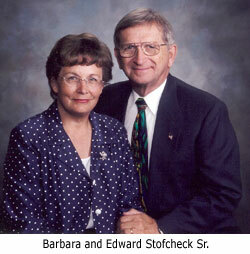 Stofcheck Funeral Home began in 1969 when Ed and Barbara Stofcheck bought the former Ford Funeral Home in La Rue. The Ford family still resides nearby. In 1973 they purchased the Cheney Funeral Home in Richwood. Besides being licensed funeral directors, Ed and Barbara also own Stofcheck Ambulance Service in La Rue and Marion, an important service in the area for many years. Kyle Stofcheck, their younger son, is a 1984 Elgin High School graduate and a 1987 graduate of the Cincinnati College of Mortuary Science. That same year, he and the former Patty Seiter of Prospect were married and they are the parents of four children: Madison, Reagan, Hayden and Paxon. Kyle and his father, Ed worked together at both funeral homes in La Rue and Richwood. In 1992, Kyle and Patty purchased both funeral homes and Ed and Barbara continue as owners/operators of the ambulance service. 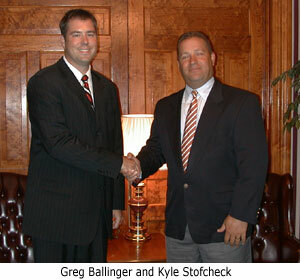 Greg and Gina purchased Ballinger Funeral Home from Janet in 2007. After much consideration, the sons of the two families decided the time was right to combine their knowledge and talents ito a single entity, and Stofcheck-Ballinger Funeral Homes began. With this new chapter in funeral home history, the communities of Richwood, Prospect and La Rue will be well served.